You’d be surprised how many people leave off their phone number on a job resume, or ignore the opportunity to include an email address in the heading. And on that latter point, make sure your email address is stable, long term, and professional sounding. Skip the one you use with your friends, PartyGirl@loadsofun.com, and opt instead for something that won’t raise eyebrows. If your job resume is over two pages, you’d better be a world-class CEO with instant name recognition. Then again, if you meet that description, you can get by with a single page, can’t you? 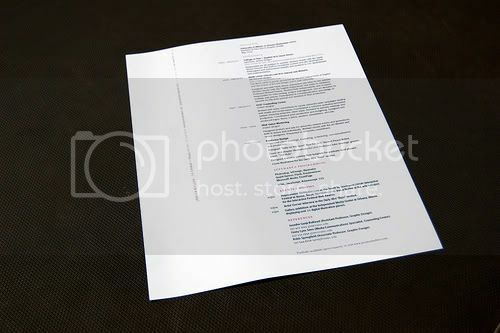 Regardless of your real or imagined worth to a company, limit your job resume to two pages max, one page ideally. With regards to all the valuable ‘stuff’ you’re leaving off the job resume, be happy you’ll have something to talk about during the interview. Nothing signals inattention to detail like a misspelled word on a resume. The job resume, the one document on which you intend to present yourself to your ideal company, and you’ve misspelled achievemints. Well, you won’t be adding to your list of achievemints with that company.